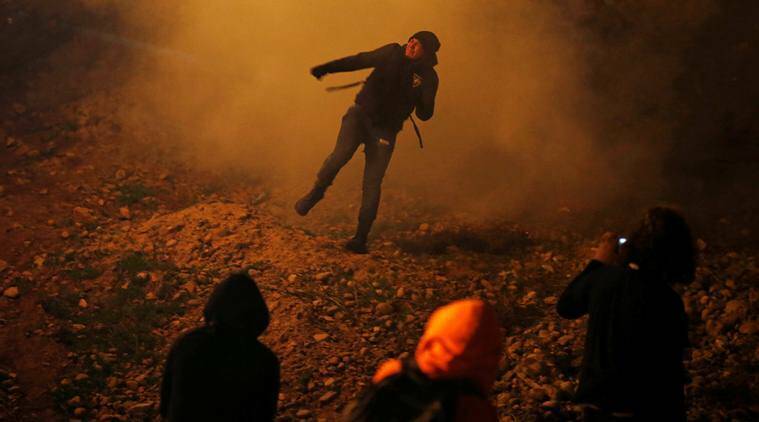 US Customs and Border Protection said in a statement later Tuesday that the gas was used to target rock throwers apart from the migrants who were trying to cross. US authorities fired tear gas into Mexico during the first hours of the new year to repel about 150 migrants who tried to breach the border fence in Tijuana. An Associated Press photographer saw at least three volleys of gas launched onto the Mexican side of the border near Tijuana’s beach that affected the migrants, including women and children, as well as journalists. The AP saw rocks thrown only after U.S. agents fired the tear gas. The agency said agents saw “toddler sized children” being passed over concertina wire with difficulty. It said its agents could not assist the children because of the rocks being thrown. Agents responded with smoke, pepper spray and tear gas, it said. The AP journalist also saw plastic pellets fired by US agents. The caravan, which left Honduras in mid-October, grew to more than 6,000 members during its month-and-a-half trek north. It has been a constant target of President Donald Trump, who referred to it frequently in the run-up to US mid-term elections in November. In a previous incident, US agents launched tear gas across the border after some migrants tried to breach the border following a peaceful march in Tijuana on November 26. Hundreds of migrants who were downwind of the gas were affected.